The Great Dunmow Flitch Way Link project will connect the two severed sections of the Flitch Way with a definitive bridleway for all non-motorised Users and provide direct access from the town centre. This safe off road route and the access to the countryside it provides will bring considerable benefit to the people of Great Dunmow and adjacent communities. It will be a beneficial facility for the most vulnerable users, novice cyclists and families with young children. This Public Right of Way will be shown on future Ordinance Survey maps. The project is included in the Great Dunmow Neighbourhood Plan and the Uttlesford Cycling Strategy. 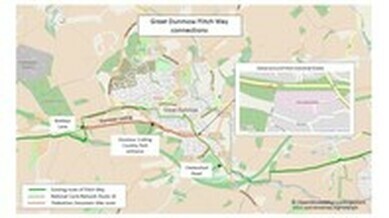 ​In order to achieve our vision of connecting the Flitch Way with a definitive bridleway we have established a good working relationship with the planning authority Uttlesford District Council, particularly with Karen Denmark, team leader for the planning process on applications affecting our route. In recent months her work has secured provisions for our project through the two developments on Ongar Road. Essex Highways are supportive and have adopted the connection project. At our first meeting with Garry White (Manager of the Public Right of Way team) on the 15th Jan 2010 he reported that the project has scored highly on the Essex County Council works list as a most important strategic creation project and he entitled the project the Great Dunmow Flitch Way Link. At a subsequent meeting Laurie Page of the Pubic Rights of Way team was introduced as being responsible for managing the negotiations with Landowners and enablement of the bridleway track. We verified the route by exploring each phase on foot. Since then planning applications for housing developments around Great Dunmow have had potential to impact on the viability of the project. Although all planning and design considerations are negotiated by Uttlesford District Council Planning Authority and Essex Highways, we recognise that we need a positive relationship with the housing developers, to communicate to them the needs and aspirations of the project and to gain their good will in the provision of requirements. In this we have been successful. The housing developers recognise that connection with our project is beneficial to the facilities provided for their developments by providing access to the Flitch Way and for cycling and walking to places of education, employment, leisure, shopping etc. We also have the support of the following organisations - Sustrans, Cycling UK (formerly the C.T.C. ), The Ramblers Association, British Horse Society and most prominently Essex Bridleways Association. The Essex Country Parks Flitch Way rangers and the Friends of the Flitch Way support the project and see the securing of this viable and safe bridleway link as a significant and worthwhile goal. Negotiations with landowners for implementation of the bridleway for Phase 1 are in the final stages. This will provide for the existing footpaths from Buttleys Lane to the boundary of the development north of Ongar Road to be upgraded to a definitive bridleway. Siemens Benefits Scheme own part of the land and unfortunately they have chosen not to co-operate. This means the Public Rights of Way (PROW) team no longer have any choice but to put a case before the Planning Inspectorate to upgrade the footpath to a bridleway, a process which can take up to 18 months. With the construction work in progress on the Redrow development north of Ongar Road it is now possible that within 2 years (i.e. by 2019) there will be a definitive bridleway from Buttleys Lane to Ongar Road. The Taylor Wimpey development under construction south of Ongar Road will result in a definitive bridleway being created within 2 years (mid 2018) as part of the planning consent. The remainder of Phase 2 will be covered by the planned Smith’s Farm development by Crest Nicholson and negotiations with landowners. A proposed route has been drawn up after discussions with the key stakeholders which should extend the bridleway to Chelmsford Road. Design work now nearing completion for a new gyratory junction on Chelmsford Road (the B1256) includes a pegasus crossing for the bridleway. This will provide a connection to Byway 57. Essex County Council are due to commence negotiations for an existing footpath to be upgraded to definitive bridleway for connection to byway 57 north of the river Chelmer. This needs a suitable replacement bridge over the Chelmer. The project relies on byway 57 for connection to the Flitch Way east of the A120 underpass. The byway surface is not fit for purpose for a bridleway that, as does the Flitch Way, provides safe convenient passage for inexperienced and vulnerable users. Solutions are being investigated with the PRoW team to rectify this. Upgrade of footpath 55 is part of the planning consent for the Redrow development and will provide a shared path for walking and cycling up to the bridge over the B1256. This will most likely be completed in one year. The remaining section connecting to High Street via New Street will be provided by Essex Highways. There is much work yet to be done. There will be difficulties and challenges but with perseverance and the goodwill we have gained we are confident of a successful completion of the project. (This update has been extracted from the original Chairman's report to the AGM held on 20 February 2017 and modified with recent developments).